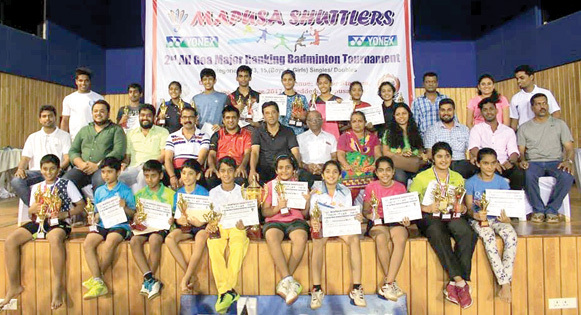 PANJIM: Rudra Dukle and Tanisha Crasto won triple and double crowns while Shourya Joshi emerged boys U-15 singles’ winner, at the All Goa Sub Junior Major Ranking Badminton Tournament organised by Mapusa Shuttlers in collaboration with Goa Badminton Association, DSYA and Yonex Sunnrise, at Peddem Sports Complex, Mapusa, recently. Tanisha and Shourya demonstrated good footwork, speed and skills to emerge deserving winners. Rudra Dukle, the rising shuttler from Margao, won the U-13 Boys singles title and the U-13 and U-15 doubles, teaming up with Yash Desai and Arjun Fallary respectively. Tanisha who won the U-15 girls singles teamed up with Lydia Barreto to emerge girls U-15 doubles champion. Arshia Gautam won the U-13 girls singles event while Andrea Kalavammpara and Aakanksha Tiwari won their maiden title in U13 girls doubles category. Chirag Mahale and Siya Kolwalkar emerged promising players of the championship.